Though the weather outside doesn’t have me in much of a Christmas mood yet, the date on the calendar tells me that it’s approaching fast. For the holidays, I like to decorate using snowman crafts. It seems that it snows here well into February (and even sometimes March) so I’ve always felt that snowmen are something that I could leave out and around the house for several months after Christmas. 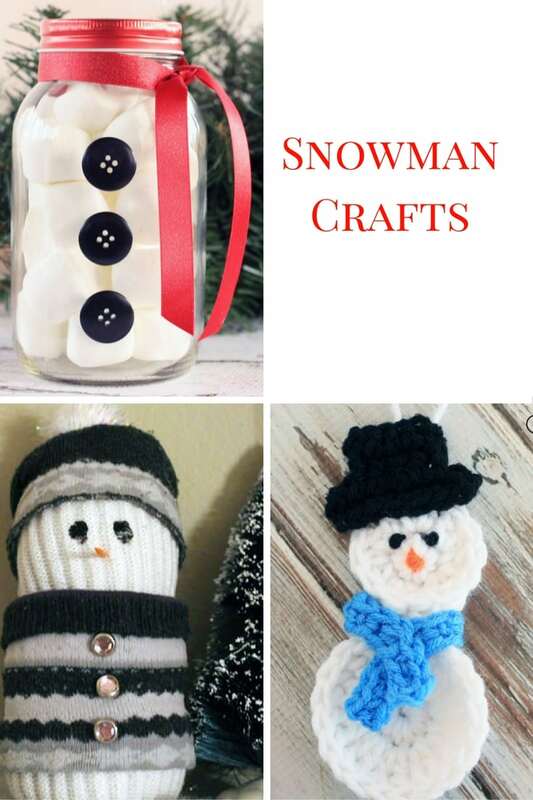 I scoured Pinterest, and came up with 20 snowman crafts for you. Even if it doesn’t snow where you live, these cute craft ideas should help put you in the mood for Christmas. Learn how to make a stuffed snowman using a sock. This cute tutorial is one that can be created using basic sewing skills and items you have sitting around the house. Learn how to crochet a snowman christmas ornament for the holiday season. This ornament would make a great Christmas stocking stuffer for the ornament collector in your family. This would be great to use as gift packaging. Image what you could fill these with! Hot cocoa, flowers, or candies would all be great gift ideas. I love this fluffy snowman wreath. Includes step-by-step how to make this gorgeous wreath. Very cute design to hang on a wall for Christmas decor, or even on the front door. I love how the yarn gives this piece a rustic feel. This crochet snowman includes a pocket for a gift card. Very cute accessory to gift to anyone who loves crochet. Very cute tutorial using three stacking fish bowls. I really like the Christmas scenes in each of the bowls. Imagine what you could do with this idea! Have lots of leftover baby food jars? What a perfect way to repurpose them with this creative gift idea for hot cocoa! Great craft to do with the kids! These adorable ornaments will light up your day! Another great craft to do with the kids. Use a milk jug, cotton balls, and glue to make this fun snowman luminary! What a clever idea! Using dollar store pizza pans for the snowman’s head. With a little paint and a hat, you’ve got a cute door hanger! These spindles painted into snowmen are adorable! Stand them by the tree, or outside on your porch. Such a cute decoration with a rustic look. These would look perfect outside on the front porch! What a fun craft to do to use up wood posts! These adorable snowman are painted and would make a great addition to your winter outdoor decor. What a great way to use those leftover pumpkins from Thanksgiving for winter decor! These painted and stacked pumpkins are the perfect way to easily move your decor from one holiday to the next. Pallet projects seem to be hot right now, and here’s a tutorial showing how to turn a pallet into a snowman shape to paint. Another great way to use pallets for crafting! Anyone who uses creamer in their coffee knows that you often have empty bottles lying around. What a great upcycled craft to do with the kids! I love giving and receiving gifts with handmade gift tags (I tend to keep them, too). What a cute idea! Great idea for Christmas gifting! I love how the wrapping looks like a snowman. I’m totally doing this for the kids this year! I picked up some coffee mugs at the dollar store the other day and am excited to make these! What a cute idea using nothing but Sharpie markers. The kids will love this! Are you excited for the holidays? Which is your favorite snowman craft? Beautiful collection of snowmen! Thank you so much for featuring my snowman wreath! Really cute snowmen. Neat ideas. Thank you.